A group of us club members met at the Hocking Hills Lodge to do some impromptu observing. Ohio is famous for a continuous blanket of clouds from the beginning of October all the way to April. For us weary observers who long for clear skies, any break in the clouds fills us with an undeniable pull towards darker skies that the Hocking Hills region provides. So Electa was packed up and I was headed south. This evening was going to be the first time using my Dark Skies Apparel Observing Vest (a review is forthcoming). I was also going to try using a music stand to hold my star charts. I showed up just before sunset and met up with Tony, Jim, Roger, Todd, Dan, and Mark in various stages of setup. The sky had some high thin stuff and contrails that we hoped would not affect our observing. Once the sun set, the skies seem to clear up more. After getting set up, I started observing objects in Orion and Taurus. The first object of the night was M42. The mirror did not have time to get equalized to the outside air temperature so the stars were not pinpoint. However, I was seeing 6 stars in the Trapezium. Jim was nice enough to let me use his 16mm Nagler which I used most of the evening. I plan to purchase one very soon. Next, I pointed Electa towards the arm of Orion and found NGC2222, a nice little planetary between the head and arm, and the “37” cluster, NGC2169. Over in Taurus, M1 had some nice detail. NGC1514, also known as the Crystal Ball did not “pop” out as much as I had hoped with an OIII filter. At this point, I started noticing the Zodiacal Light! It stretched all the way up to the Pleides when you used averted vision. I continued observing various objects in the winter sky. One of the highlights was the Horsehead Nebula using a H-Beta filter, especially in Jim’s 12″ Teeter telescope. 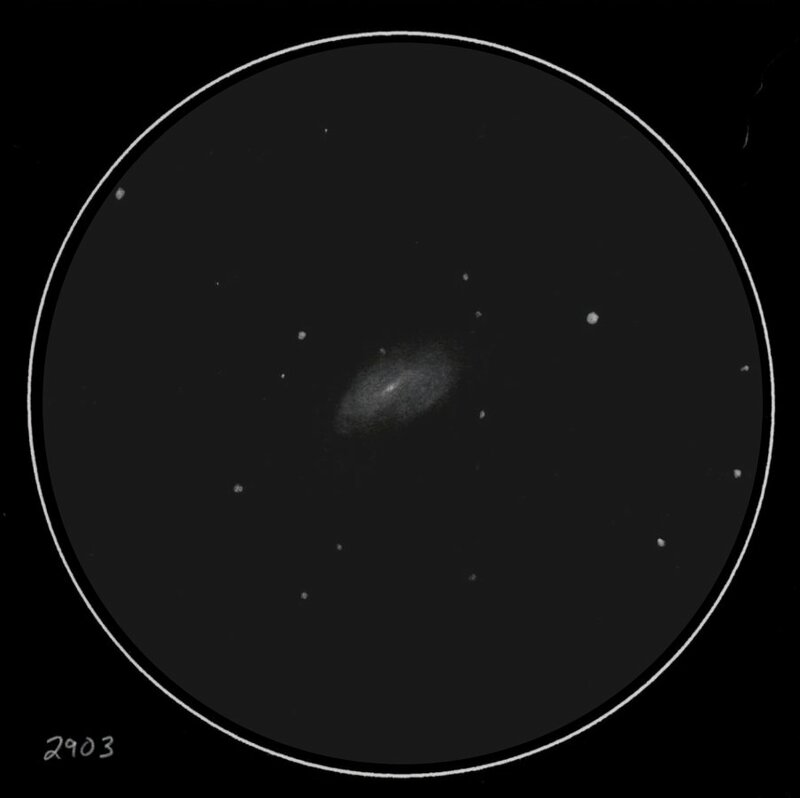 About this time I started on my first sketch, NGC2903. It felt good to get the pencils out again and do some sketching. Things were coming along well! I started walking around and having a peek at what others have been observing. Tom Beck and his wife showed up about 10:30pm or so and enjoyed the views through the various telescopes. Roger was imaging M1 for the first time using longer integrations (4 minutes I believe). Dan brought his Orion 110mm APO which presented an awesome view of M42. Tony brought the club’s 16″ and was finding many faint fuzzies in the eyepiece. Meanwhile, we were all listening to the Blue Jackets game on the radio. The interesting thing about this is Tony actually works in radio and works on the very radio program we were listening to (of course, not this evening). One of my goals for the evening was to see if I can observe some of the galaxies located in the Beehive Cluster (M44). Sue French had an article a few years back about observing these galaxies. Jim and I took the challenge and was able to see NGC2624 and NGC2625. 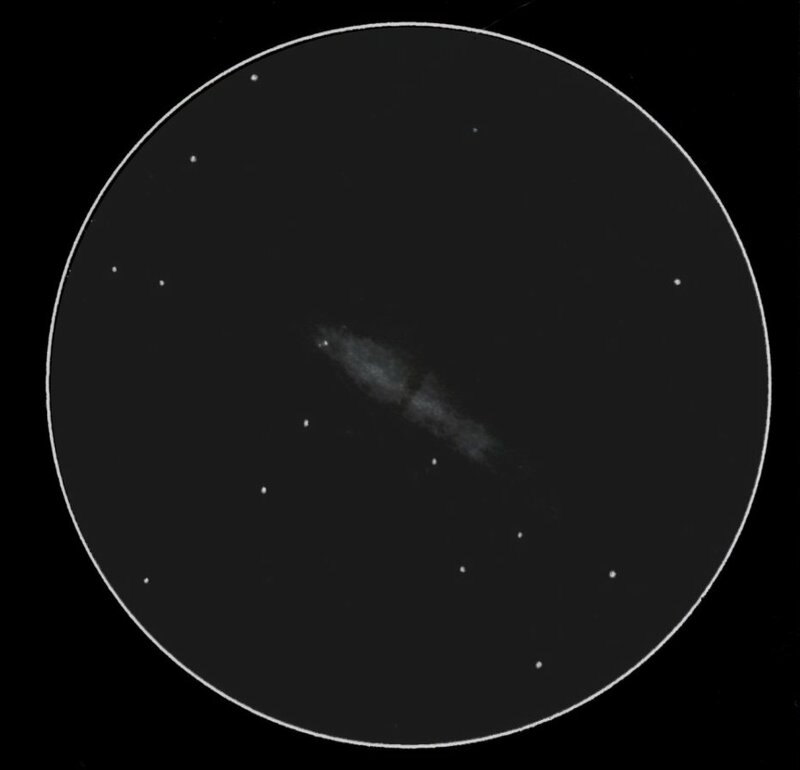 According to Sky Tools, these galaxies were 14.7 and 15.2. Not bad at all! 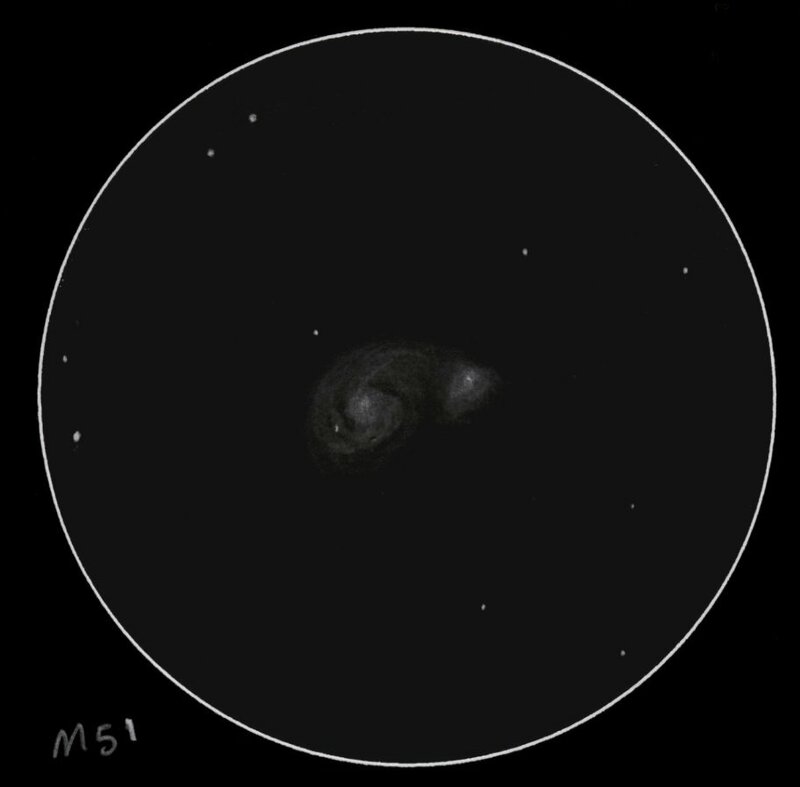 I proceeded towards Ursa Major to get M51. I have always wanted to sketch this object. So I settled in to some sketching. Having the hood over my head really helped get some of the fainter details out. I am on a roll. I wanted to keep sketching and toss my original plan of following my typical observing pattern of picking a page in the Pocket Observing Guide and observing the objects listed on the page. My next object was M82. I want to revisit M82 again as I think I can do better with it. I decided to do some more observing in my favorite region of the sky. I just love the galaxies that populate the area beneath the Big Dipper’s handle all the way to the bottom of Coma Berenices. Objects such as M94, M63, M64, The Whale (4631), The Hockey Stick (4656), and the Silver Needle (4244). How appropriate was it that we were listening to a hockey game on the radio, and I was observing the Hockey Stick Galaxy? 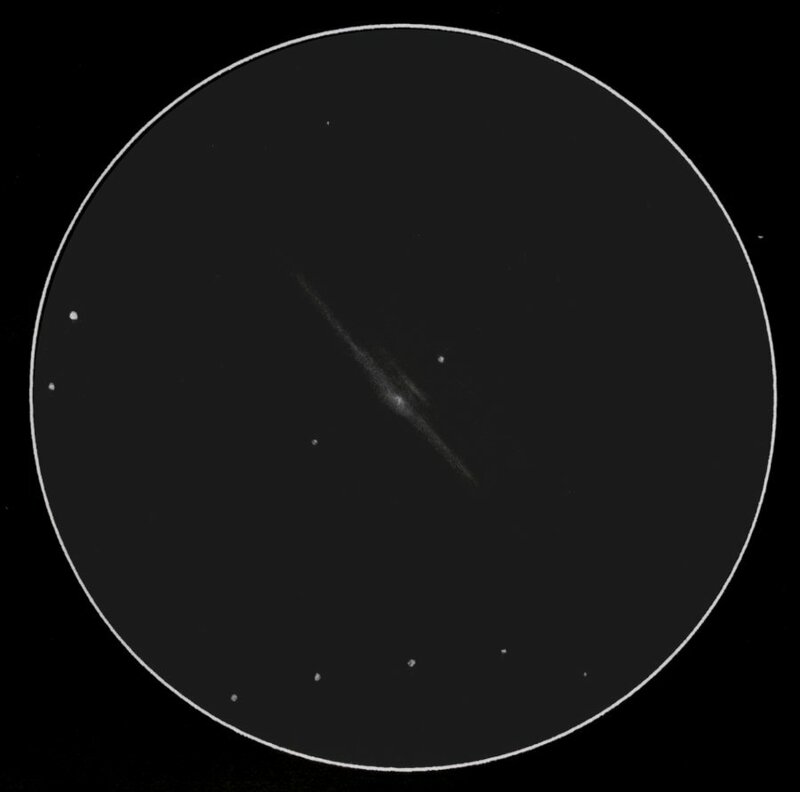 Finally, I decided to sketch one more time, and that was my second favorite galaxy, NGC4565. I spent some time looking at some more objects of spring like the Leo Triplet, NGC4762 and 4754 in Virgo (a pair that my late telescope making mentor, Ron Ravneberg, enjoyed), and others. I finished the night off with some of the early summer objects objects like M3 and M13. I was getting tired, and the only ones left was Tony, Jim, and I. I finished the night with Saturn. Seeing still was not very good, and we were not able to see the storm either. Tony was already mostly packed by this time. Jim and I hung around to about 1:30 before we decided to pack it all up and head home. A nice evening during one of those rare clear winter Ohio nights. My observing vest has got to be one of the best astronomy purchases I have made. The music stand proved to be a valuable part of my observing equipment and will accompany me to many more observing sessions. ~ by jhissong on 2011/03/02. Just love the “Deep Sky Monks” photo by Roger Wiltfong. You or Roger should send it to Dark Skies Apparel and they’ll post it on their Observations page. Couldn’t agree with you more about the Dark Skies Apparel Observing Vest being one of the best astronomy purchases ever. I purchased mine last summer. Absolutely love it and now I can’t observe without it. Recently acquired the new solar (white) version of the vest; just waiting for the Sun to make a prolonged visit before I’m able to try it out.